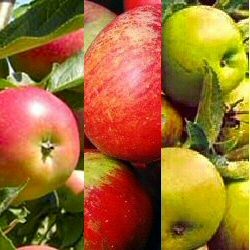 Buy fruit trees for sale online from UK specialist suppliers of garden fruit trees. Choose any five fruit trees (12 Litre or 7 Litre containers) from across our newly increased range and receive a sixth tree free of charge. This free fruit tree offer is proving to be very popular and some ranges are being sold very quickly. Please tell us at checkout (the text box at the bottom of the checkout page) which trees you require and the rootstocks you want them supplied on. Offer does not apply to Family Apple or Pear Trees.